This page will show you how to build and play a homemade musical instrument based on the Australian Didgeridoo. It includes: 1) Virtual Didgeritubes you can play right now on your computer; 2) directions on how to build a 5-note set of Didgeritubes; and 3) information on building and playing an 8-note set of Didgeritubes. Also, if you're participating in Science Olympiad, be sure to check out our 2014 Science Olympiad Addendum. So take a couple of minutes, play the Virtual Didgeritubes, learn how to make your instrument, and discover all of the great songs you can play. Our Virtual Didgeritubes play the 1st, 2nd, 3rd, 5th & 6th notes of the Major Scale. It's called the Pentatonic Scale (see below). As you will hear, the longer the tube, the lower the pitch — the shorter the tube, the higher the pitch. Start by clicking your mouse on each tube (below). Then, choose a song and start playing. The sounds you hear are produced by buzzing your lips into each tube. If you would like to make this instrument, just follow the directions below. Begin by getting approximately 8 feet (250 cm) of class 200 - 3/4 inch PVC sprinkler pipe. Wrap electrical tape around the top of each tube. 1) Cut the tubing into the five sections listed on the left. 2) Wrap a 4-inch strip of electrical tape around the top end of each tube. Notice that the midpoint of the tape is positioned at the top of the tube—as shown on the right. 3) Using your index finger, push the outside portion of the tape into the tube, so that it sticks to the inside wall. 4) Wrap two 15-inch strips of duct tape around the set as shown below. 5) Before you try playing the instrument, practice your buzz! Press your lips lightly together, and produce a buzzing sound by making your lips vibrate. Try buzzing higher, lower, louder, and softer—try buzzing your favorite song. The better you are at buzzing, the better your instrument will sound. 6) Lightly press your lips against the one of the tubes and buzz. To produce a fuller sound, take a bigger breath and buzz more air into the tube. If you would like to build an 8-note set that plays many more songs, see below. Phil and his daughter, Sarah, have created a special resource on building and playing Didgeritubes! 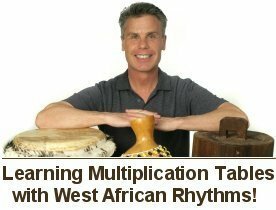 It includes step-by-step instructions, exact measurements, sheet music written in treble clef, and play-along music tracks. It has everything you need to be successful with your project, from beginning exercises to duets and quartets you can play with your friends. Just like our homemade water bottle xylophone, glockenspiel, panpipes, fraction tubes, and melodic tube drums, our Didgeritubes are tuned to play an 8-note scale in the key of C — and if you want more than 8 tubes in your set, check out our new 2014 Science Olympiad Addendum! 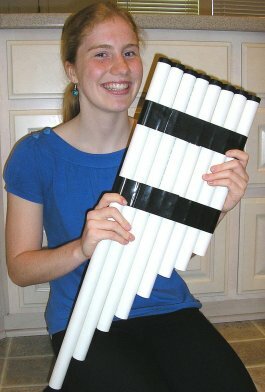 Phil’s daughter, Sarah, shows you how to make and play a cool set of “Didgeritubes” out of PVC pipe, a little glue, and some tape! This 8-note set is tuned to the key of “C” and is played by buzzing your lips—just like an Australian Didgeridoo. She provides exact measurements, specific recommendations for your materials, and expert building and playing tips so your didgeritubes resonate correctly and sound in-tune. To help you learn faster, Phil and Sarah have also included sheet music written in treble clef, and play along tracks for each song! It's the perfect project for scouts who are making a homemade instrument. In fact, you will see many scouting songs in this package. Homeschoolers will also enjoy the project as a cross-curricular activity on math, measurement, music, and the physics of sound. If you’re building an instrument based on the 2014 Science Olympiad requirements, please see the addendum below. To download this PDF book on "Building and Playing Didgeritubes" along with all the music tracks, just click the "Buy Now" button below. If you would like to build a wind instrument for the 2014 Division B Science Olympiad Competition, Phil and Sarah have now included all of the tube lengths to make "Instrument 2" for the Sounds of Music event. In their addendum, you will learn the pitch names, exact tube lengths (in centimeters), and frequencies (in Hertz) for all 27 notes in the “allowable scoring range” between C2 and D4. The tube lengths are tuned and calibrated to an "A-440", and the frequencies they produce are precisely based on the “12 tone tempered scale.” Additionally, you will learn exactly which tubes to play for the required “C Major Scale (C3-C4)”, as well as the formula for equal tempered tuning. This addendum is now included at no extra charge in the above package, "Building and Playing Didgeritubes" by Phil and Sarah Tulga. 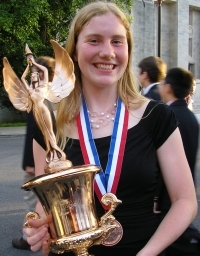 Also, see Phil and Sarah's Panpipes, Glockenspiel, and Melodic Tube Drums for other instruments that meet the 2014 Science Olympiad requirements.